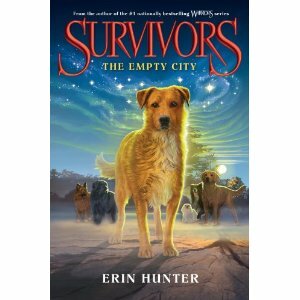 The awesome people at Harper Children’s just sent us five hardback copies of Survivors- The Empty City today and we are passing them on to our readers! Book Summary From Goodreads: The time has come for dogs to rule the wild. Lucky is a golden-haired mutt with a nose for survival. He has always been a loner—roaming the streets of the busy city and relying on his instincts to get by. Other dogs have Packs, but Lucky doesn’t long for the days he spent with his littermates. He stands alone. Then the Big Growl strikes. Suddenly the ground is split wide open. The Trap House is destroyed. And all the longpaws have disappeared. Now Lucky is trapped in a strange and desolate new world with no food, foul water, and enemies at every turn. He falls in with others left behind, including his littermate Bella, a Leashed dog. Relying on other dogs—and having them depend on him—brings new dangers that Lucky isn’t prepared for, but he may not be able to survive on his own. Can Lucky ever be a true Pack dog? Harper Collins is offering a sneak peek to our readers. Click here to read an excerpt. Harper Collins is offering a sneak peek to our readers. Click here to read an excerpt before it hits the stores.